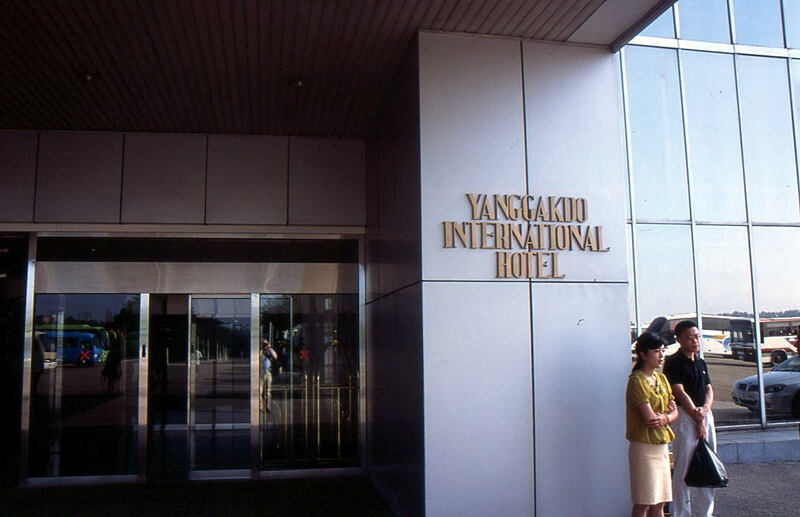 Built in 1986 the Yanggakdo Hotel is located on Yanggak Islet, in the middle of the Taedong River. 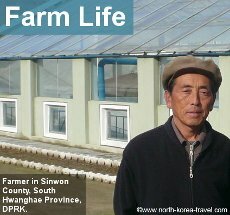 With 47 floors and 1001 bedrooms this is one of the largest hotels in the DPRK and one that offers some of the best conditions. While staying here you will never be bored as it has countless facilities. 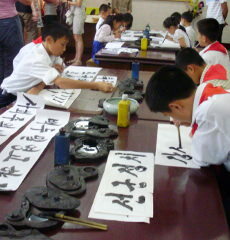 The staff is extremely friendly too always willing to engage with foreigners. In the basement you will find a large array of entertainment. 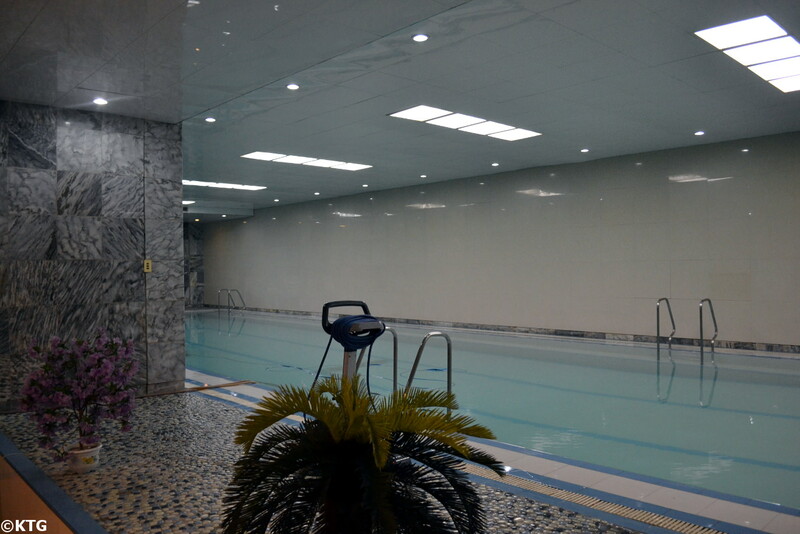 This includes the casino, swimming pool, sauna where you can have a massages, bowling alley, karaoke area, pool table room, cold noodle restaurant, table tennis room etc. We usually go to the bowling alley with our local Korean guides, a great way to get to know them at a more personal level, in the evenings. And make sure you do not miss the revolving restaurant on the 47th floor as it has one of the finest panoramic views of Pyongyang. If you have the chance of doing so, we highly recommend you watch the sun set from up here. After a long day of travel around North Korea, we usually gather at the revolving restaurant of the Yanggakdo Hotel in the evenings for a drink, sharing our impressions and exchanging views while enjoying the views of the capital of North Korea. On the ground floor as you walk into the hotel, you will also find a bar to the right (right behind the aquarium famous for hosting the longest guest in the hotel; the giant turtle) which serves great locally brewed draft beer. It is too a fantastic place to relax and socialise after a long day. On the left hand side of the lobby of the Yanggakdo Hotel there is a fabulous bookshop which has a rich variety of DVDs North Korean books, translated into many languages. 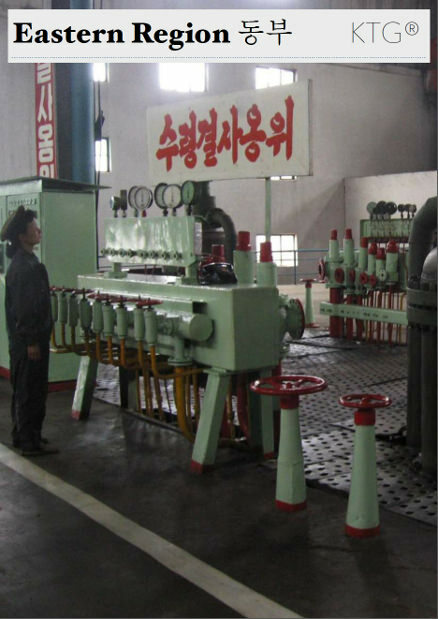 Here you can purchase books from the Juche Ideology and the Great Leaders to guide books and books on Korean cuisine. Souvenirs such as postcards, stamps, pins or hand painted posters of the Mass Games are also available. 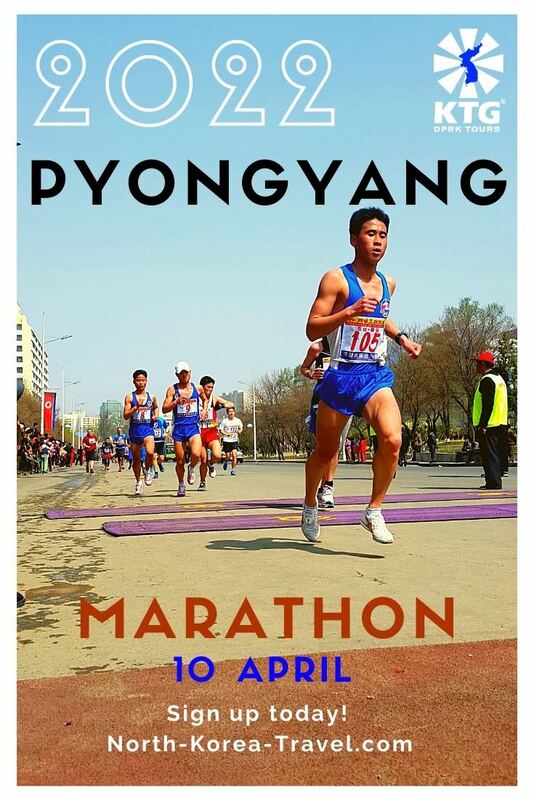 Note: DPRK DVDs for sale usually have subtitles in different languages, including English. 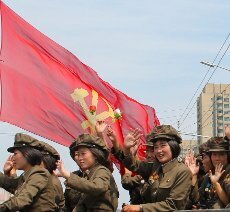 These are movies that regular North Koreans watch and offer you an opportunity to see the values that are deemed important in the DPRK political system and that are spread to the citizens of North Korea. There are also two small shops on the same floor where you can get supplies of drinks and snacks, cosmetics, small souvenirs and even traditional Korean outfits! However if what you are looking for is a custom made suit you should head to the third floor. 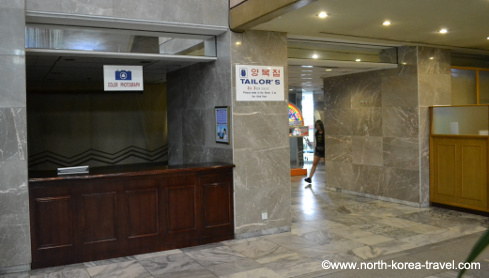 North Korean Tailor - the ground floor of the Yanggakdo Hotel is marked as Floor 2 and the tailor is on Floor 3. The elevator does not stop at floor 3, so you need to walk there from the ground floor up the marble staircase that can be see on the right hand side of the lobby as you enter the hotel. You can buy custom made winter jackets, suits, traditional Korean outfits and even the olive green jumpsuits that many Koreans wear. Rates are reasonable (90 Euros for a winter jacket) but you can bargain a little, for example if you would not like trousers for the jump suit and are happy with just the jacket. Please note that if you are used to bargaining in China the principles here are not the same, and you should kindly ask for a small discount! If interested in having custom clothes made we recommend you to go to the tailor’s on your day of arrival (or the following morning) as they are not always opened and this will also give them time to make your outfit. The "third" floor also has a barber shop. Indeed having a haircut in Pyongyang is not something that many foreigners may have experienced. 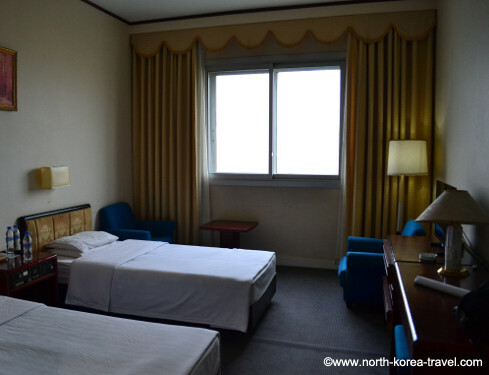 The bedrooms in the Yanggakdo Hotel are spacious and clean, and the views from the top floors are great for taking photographs of the city. 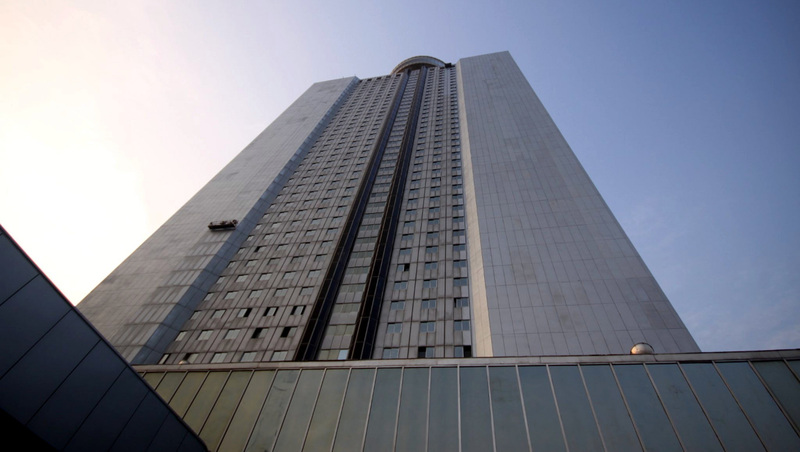 We tend to book floors high up in order to offer travellers the best views of Pyongyang! If, however, you would rather stay in a lower floor, please do let us know beforehand. Rooms have AC, local and international TV channels like the BBC World News, a small fridge, kettle and a bathroom with a bathtub (24 hour hot water), towels, toiletries, slippers, etc. You can also make international calls from the rooms, however we recommend you to check rates before doing so as these will vary and can go up to 6 Euros per minute depending on where you are calling. If you would like to use the internet for emails you will have to do so from the communications centre at the lobby. There is laundry service too. Just place your clothes in the laundry bag provided in the room in the morning and when you come back in the evening it will be ready for you on the bed. You can see the laundry price list usually kept in the drawer under your desk. 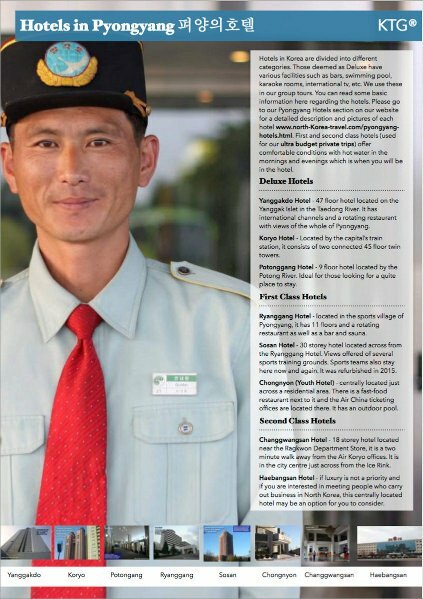 Timing - Although there are several lifts in the Yanggakdo Hotel, they can take a while to reach a floor. When a meeting time is arranged with others you should spare a few minutes for the lifts to arrive. This is especially the case when going to the rotating restaurant on the 47th floor as only two lifts lead up here, meaning that the waiting time will more likely than not be longer (sometimes you should spare up to 10 minutes or so!). The doors can be aggressive! Yes, they close quite soon and do not have sensors that will allow them to re-open automatically if an object is in between, so please watch out when going through the elevator doors! The Yanggakdo Hotel has are a number of restaurants in including a Chinese restaurant. Breakfast is usually served on the ground floor in one of the two buffet rooms, where they serve a variety of both Korean and Western food like toast, omelet, yogurt, coffee, tea, sponge cakes, etc. 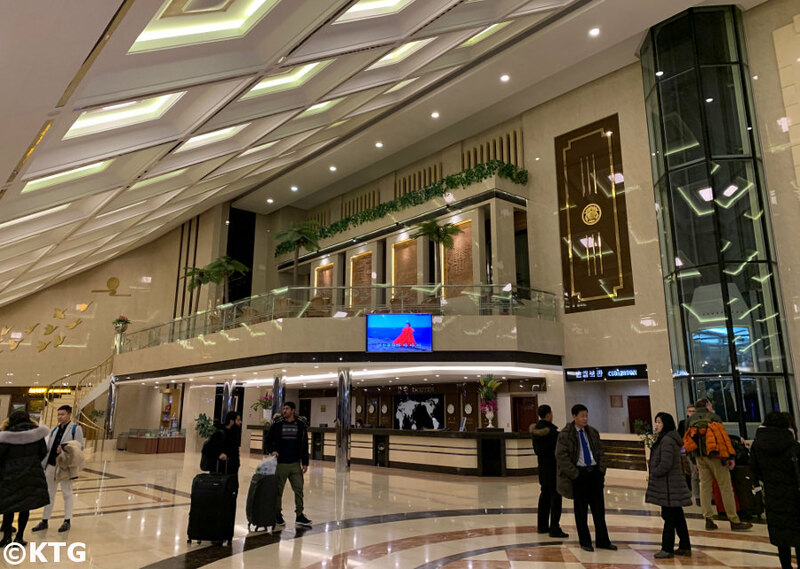 Please check our Pyongyang Hotels section to see other hotels in the capital of North Korea other than the Yanggakdo Hotel or go to our North Korea Hotels page for an overview of hotels around the country.